The SV-2000 Series has been discontinued. Please see the AAV-1000B Series as a possible alternative or contact our Flow Engineering Department. SV-2000 Series “Black Mushroom” angle seat valves are ideal for use in On/Off fluid control applications where an actuated ball valve might normally be used. 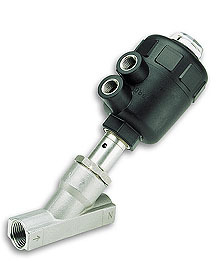 These 2-way, externally piloted angle seat valves are operated by a single- or double-acting piston actuator. Sizes range from 1/2 to 2 NPT. The SV-2000 valves provide twice the average cycle life of ball valves, and are less expensive! Their compact design makes for easier utilization in OEM applications. Easy to install in any attitude, they feature a rotatable actuator for selective positioning of the pneumatic pilot inlet port. Standard features include visual position indicators, an articulated plug holder that assures positive sealing, and spring-loaded double PTFE seals that separate and isolate the process fluid. Maintenance is simple. When the seat seal is being replaced, the valve body remains in the line. Servicing the actuator is safe and fast, as there is no pre-loaded spring tension on the housing.